This absolutely charming octogenarian Joan Wilson (nee Leighton) has the most amazing memory and recall of detail. She was born in the 1920’s at The Square Monument Lane, Codnor Park. Her mother Dorothy ‘Dolly’ Leighton (nee Wain) from Tunnel Row, Pye Hill reached the grand old age of 100 and worked at the James Oakes & Co Pipeyard during WW1. Joan’s father Fred started at the Codnor Park Forge as a ball furnaceman and was later promoted to foreman and then under manager. If a furnace wouldn’t fire, he’d say “Come out and let me in there!” And Fred would fix the problem. Joan grew up on Forge Row at Codnor Park and one day around teatime there was a terrible bashing sound at the front door. It was their father Fred, he had been hit by flying metal at the forge and crashed into the house dripping with blood. At first they lived in a house with a shared yard at Forge Row and Joan has fond memories of their neighbours, ‘The Matthews’ and their son who had a terrible stutter but nonetheless did well for himself in life. The Leighton family later moved to a house on Forge Row with a private yard and Joan remembers the dolly tub, ponch, mangle, copper and tin bath hanging on a nail. Photo: Wash day at Forge Row. 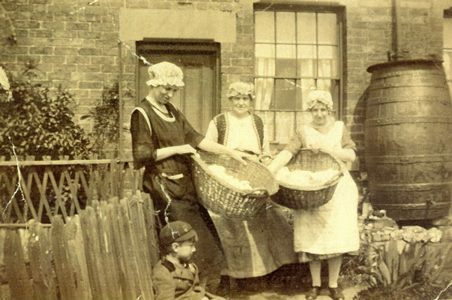 Mum Dolly Leighton far left with mop cap on and Joan’s brother Fred, front left. Courtesy The Leighton Family.